Because Humans will always matter first, AVSimulation stands out among competition as the only major player that develops both simulation software (SCANeR™) and driving simulators. This is rooted in our belief that being at the edge of hardware development makes our software better and vice-versa. 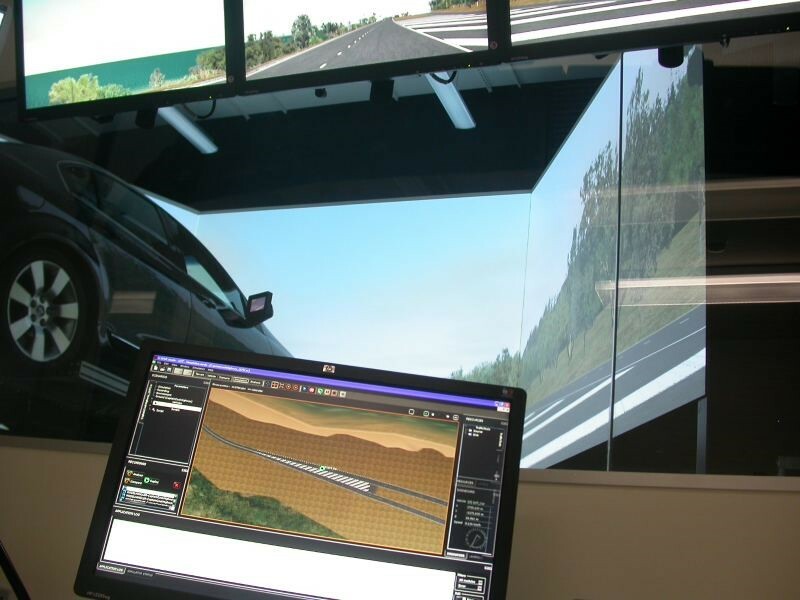 SCANeR™ studio is a comprehensive software suite dedicated to automotive and transport simulation addressing both testing and driving for ADAS, Autonomous vehicle, HMI and headlight use cases. 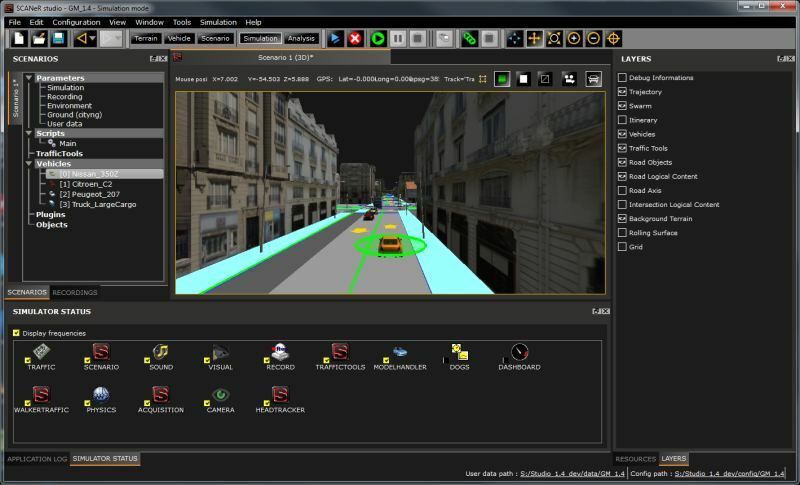 SCANeR™studio provides all the tools and models that are necessary to build an ultra-realistic virtual World: road environment, vehicle dynamics, traffic, sensors, real or virtual drivers, headlights, weather conditions and scenario scripting. Far from being a “black box” tool, it is a genuine modular simulation platform, flexible, expandable and open, meeting the needs of researchers and engineers. Its versatility makes a complete range of setups possible: driving simulators, model-in-the-loop, software-in-the-loop, hardware-in-the-loop. The Advanced simulator is AVSimulation’s most immersive simulator. It encompasses the entirety of a real vehicle, from its driving compartment to its instruments. 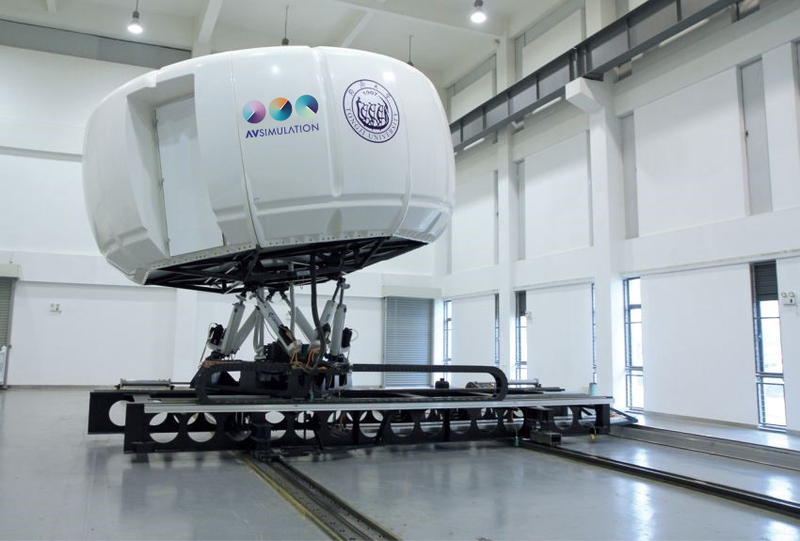 Positioned inside a dome and fitted with a cutting-edge visual system offering up to a 360° view and a motion platform providing up to 9 degrees of freedom, the Advanced Simulator is the most immersive simulation solution available. Customizable according to the client’s needs, this high-performance simulator is designed specifically as a research and engineering tool, making AVSimulation the world leader in this field. 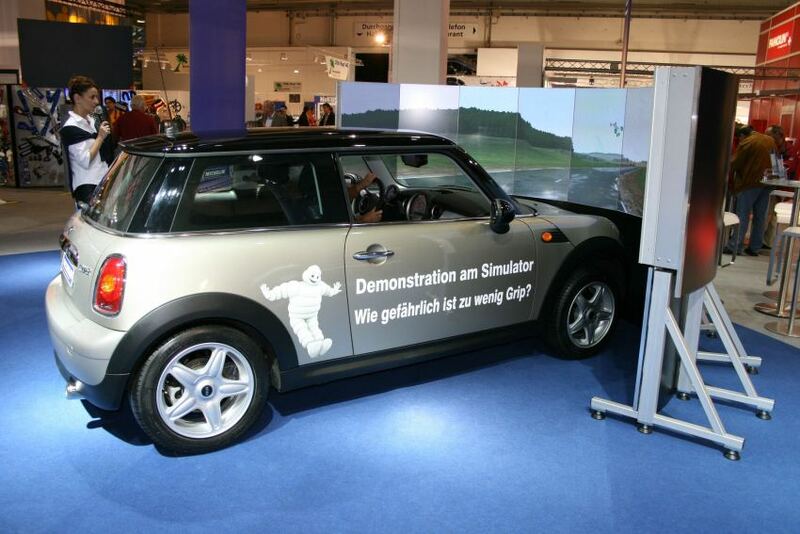 The Full-Scale Simulator is aimed at clients requiring a real vehicle driving cabin. From any model of car or truck, AVSimulation delivers a driving simulator incorporating a real vehicle’s driving cabin in order to offer the driver the most realistic driving environment. An actual vehicle is fixed on a 3 to 6 Degree of Freedom motion platform and makes use of a display system of 1 to 8 channels for complete immersion. Customizable with a series of available options in accordance with the client’s requirements, this “real cabin” simulator is used in the field of Human Factor research, Ergonomics Studies and advanced research projects, studies on Dynamic Vehicle Handling and studies of “Human and Hardware in Loop”( HHIL). 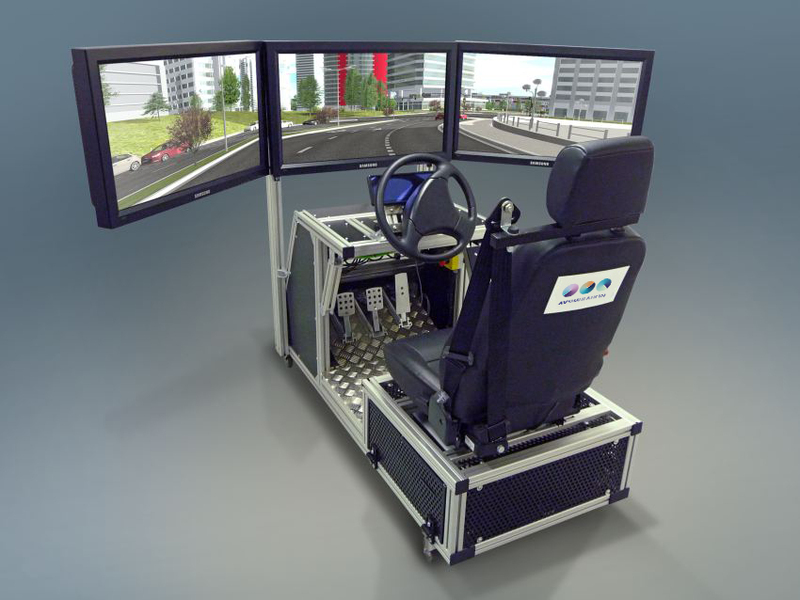 The Compact Simulator provides the driver with a realistic driving interface and a large vision field at low cost. Its reduced size makes it easily transportable between several sites. This simulator is equipped with features including 3 * 16/9 LCD screens, a manual or automatic gearbox, a handbrake and real steering wheel with force-feedback. It can also be equipped with a 3 to 6 Degree of Freedom motion system as an option. 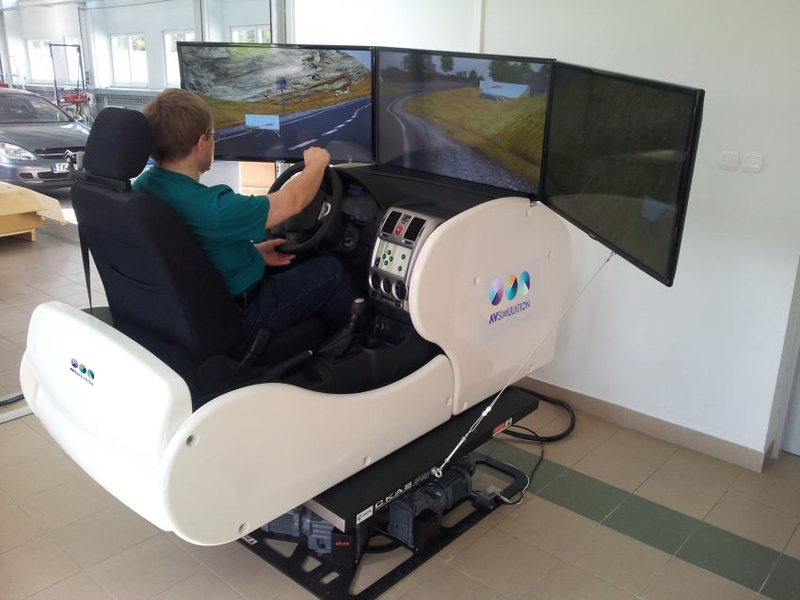 It is particularly valued by Universities, training institutes and the engineering and research sectors, which use it as a driver training simulator. We accompany our clients in the development of specific solutions and in their system integration. With the power of SCANeR ™ studio, it enables you to create high fidelity simulators. It includes more specific functions for creating training simulators such as : Student and assessment results management, Simplified graphical interface for self training, Centralized monitoring tool for several simulators. The software is provided as an SDK for the integrator and is available in volume as “runtime” for deployments with end customers. A set of training modules is available to support integrators when starting their simulator training project.